Santa Monica’s rent control ordinance dates back to 1979, and it has undergone significant revision since 1995. The MAR makes up the bulk of Santa Monica rents, and the MAR is recorded annually by the city. Santa Monica’s rent control ordinance works by limiting annual rent increases during your tenancy. The initial rent agreed to at the beginning of your tenancy establishes your base rent. Subsequently, when you renegotiate your annual lease and associated rent increase, the ordinance limits the maximum permissible rent increase and specifies the Maximum Allowable Rent (MAR). When a tenant vacates the unit, the landlord can return the rent amount to market levels. The Maximum Allowable Rent (MAR) is the product of your initial base rent plus the “General Adjustment” determined by Santa Monica’s Rent Control Board. The “General Adjustment” or “GA” is the permissible percentage by which your landlord may increase your annual rent. 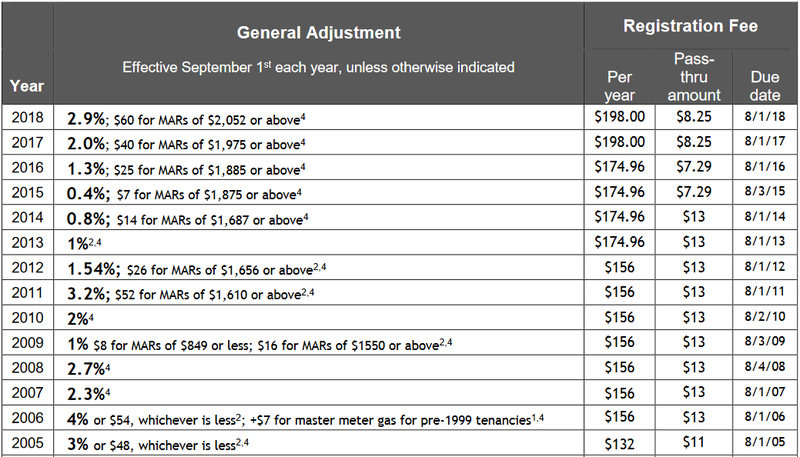 The annual GA rates are published by the Rent Control Board. The GA rates fluctuate relative to inflation. In addition to the Maximum Allowable Rent, tenants will likely pay a monthly pass-through fee equal to half of the annual registration fee that the Rent Control Board charges for each unit. Landlords pay the other half of the registration fee. The annual registration fee funds the Board and allows the Board to collect rent data. In 2018, the monthly pass-through fee was only $8.25 in addition to the MAR. Low-income seniors over age 62 and low-income people with disabilities can file to have the pass-through fee waived by the City of Santa Monica. Waivers for tenants are available HERE. Lastly, landlords may forward a third type of expense to tenants—surcharges. These surcharges consist of certain line items from the landlord/owner’s property tax bill. These surcharges are limited to Community College Bonds, Unified School Bonds, Stormwater Management User Fees, Clean Beaches and Ocean Parcel Tax, and the School District Parcel Tax. A landlord who wants to forward these surcharges to tenants to pay must provide the tenant with a copy of the property tax bill annually, so the tenant may verify the surcharge amount. Effective September 1, 2018, are new limits on the amount of property-tax-related surcharges that may be passed through to tenants. Property-tax-related surcharges may not exceed actual pro-rated amounts from the property tax bill, 4% of the 2018/2019 Maximum Allowable Rent for a unit, or $35, whichever of these is less. Landlords should provide tenants with annual notices summarizing the three components of rent at least one month prior to any rent increase. If an owner collects more rent than is allowed, a tenant may file a complaint with the Rent Control Board for collection of excess rent to have the overcharges reimbursed. Tenants have additional recourse. Tenants whose rental units need repair or maintenance, or whose housing services or amenities have been reduced, may petition to have their monthly rent decreased. A rent decrease stays in effect until the necessary repairs have been made or amenities restored. Santa Monica also has an anti-harassment ordinance enforced by the City Attorney’s Office. If a tenant feels they are is being harassed with actions intended to induce them to vacant a home, the tenant may contact the City Attorney’s Office at (310) 458-8336 or file a complaint online.